Every mile you walk puts 60 tons of stress on each foot. Your feet can handle a heavy load, but too much stress pushes them over their limits. When you pound your feet on hard surfaces by sporting activity or by wearing shoes that irritate sensitive tissues, you may develop heel pain, the most common problem affecting the foot and ankle in middle age. Many people try to ignore the early signs of heel pain and keep on doing the activities that caused it and when you continue to use a sore heel, it will only get worse and could become a chronic condition leading to more problems. 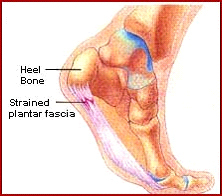 Plantar Fasciitis – Plantar fasciitis is the most common condition that causes heel pain. Plantar Fasciitis is due to irritation and inflammation of the tight tissue that forms the arch of the foot. Common symptoms of plantar fasciitis include heel pain with prolonged walking and standing. Heel Spur – A spur is commonly associated with plantar fasciitis. This problem is most commonly seen in patients who have long standing heel pain due to plantar fasciitis. A small bony growth occurs on the calcaneum which is the supporting bone of the foot and ankle which irritates the supporting tendons and causes pain. Tarsal Tunnel Syndrome -Tarsal tunnel syndrome causes a large nerve in the back of the foot to become entrapped, or pinched. Similar to carpal tunnel syndrome in the hand, tarsal tunnel syndrome can cause heel pain. Stress Fractures – Stress fractures of the calcaneus bone are an uncommon cause of heel pain. Stress fractures should be considered especially in athletes such as long distance runners who have heel pain. Posterior Heel Pain -Posterior heel pain causes symptoms behind the foot, rather than underneath. 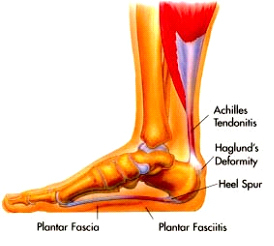 Posterior heel pain causes include Achilles tendonitis and retrocalcaneal bursitis. It’s a wrong notion that homeopathy treatment gives relief only in long standing, chronic complaints and does not give required relief in acute, painful conditions. This is proved wrong by many patients who enter the clinic limping and agonized in pain and when they come for a follow up visit in a weeks’ time they are perfectly fine and have a smile on their face. Does anyone need more proof? We have some miraculous medicines which have helped more than 500 patients in the last few years for heel pain, irrespective of the underlying cause. Amazingly effective medicines like Ledum Pal and Hypericum give the patient immediate relief from the unbearable pain which he or she has been suffering since a long time. Strong painkiller medicines are avoided and so the patient is also relieved of the side effects of these medications like acidity, heartburn etc. Cinnabaris and Ranunculus are two more wonder drugs for spurs and the pinched pain that gives patients days of agony and despair and he almost is bed ridden and cannot even do his daily routine work efficiently. Let the hands of an able and experienced Homeopathic doctor hold you and let you out of this agony. As its only experience and years of study that enable him to decide on the medicine best suited for an individual. Stop all impact sports and rest the foot especially if you are involved in some heavy sporting activity, and remember this is only for few initial days. Stretching the plantar fascia and Achilles tendon with some simple exercises is effective in reducing symptoms. The Doctor will help you with these stretching exercises. Use shoes with better heel cushioning, or include a heel cup or heel cushion for preventing hard surface irritating the heels repeatedly while walking. Apply ice to the heel. Freeze a plastic bottle of water and roll your foot over it. This is especially of benefit in acute pains.